The Center for Disease Control has a fantastic website, follow this link to see their Health and Safety in South Africa page. Hepatitus A: You can get hepatitis A through contaminated food or water in South Africa, regardless of where you are eating or staying. Typhoid: You can get typhoid through contaminated food or water in rural areas of South Africa, or if you are an adventurous eater. Rabies: Rabies can be found in dogs, bats, and other mammals in South Africa. 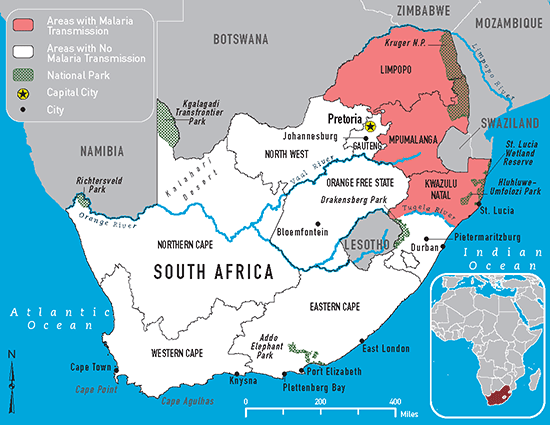 When traveling in South Africa, you should avoid mosquito bites to prevent malaria. Below is a map of areas with malaria transmission. The Wild Coast, near East London, is malaria-free. Kruger National Park, near Sabi Sabi Reserve, has malaria-presence. We will be near Kruger National Park for 4 days; and although the lodge provides mosquito netting, Park Rangers recommend taking malarial prophylactics to prevent transmission. Recommended chemoprophylaxis: Atovaquone-proguanil (Malarone), doxycycline, or mefloquine. Cover exposed skin by wearing long-sleeved shirts/long pants. Use a bed net if the area you are sleeping is exposed to the outdoors. If you do choose to take prescription medicine, see CDC’s advice on choosing a drug to prevent malaria.